A stone commemorating the location of a scared fire in Waterdown’s Souharissen Natural Area was dedicated during a ceremony on Nov. 7. 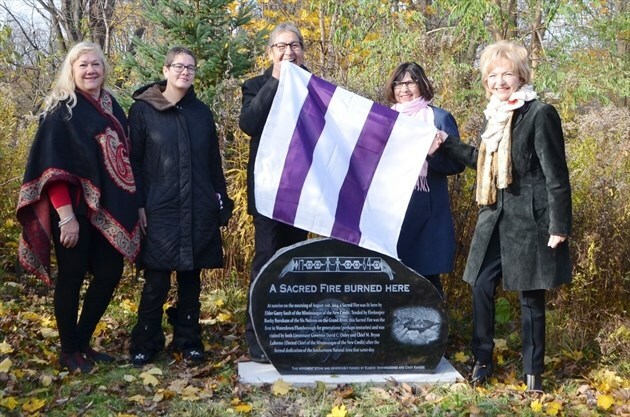 The stone was donated by former Waterdown District High School teacher Eugene Kahgee and his wife Cindy, in commemoration of a sacred fire started by Mississaugas of the New Credit Elder Garry Sault on Aug. 21, 2014 and tended by Rocky Burnham of Six Nations of the Grand River. The fire was lit as part of the dedication of the Souharissen area — which covers 55 acres in Waterdown — located just south of Dundas Street, stretching from Burke Street to just north of Flanders Drive. It is located on the traditional territory of the Chonnonton, Haudenosaunee and Mississaugas of the New Credit First Nations; the Souharissen is the result of years of work following the discovery of 104 aboriginal archeological sites in the Waterdown Bay Development Area in 2005. WDHS History teacher Nathan Tidridge said that the fire, which was visited by Mississaugas of the New Credit Chief M. Bryan Laforme and Ontario Lieutenant Governor David Onley in 2014, is believed to have been the first sacred fire in the Flamborough and Waterdown area for generations — perhaps centuries. Tidridge noted that the area helps highlight the living Indigenous identity of Waterdown. He said that prior to the stone dedication there had been a makeshift signage to designate the site, but the Kahgees wanted to give back to the community and highlight the important space with the permanent marker. “Now we have this beautiful permanent marker, to tell people who walk by,” Tidridge said. Ward 15 Coun. Judi Partridge noted that about a year-and-a-half ago, city staff tried to remove the sacred fire pit, as they thought neighbourhood children had been building fires.